Why is it said that Diabetics (Type 2) should keep eating at regular intervals? What will be the effect of prolonged fasting (say 24 hrs or so) on a person in the pre-diabetic range and not taking any allopathic medicine but resorting to naturopathy. Shouldn't the lack of external input (in the form of food) keep reducing the sugar level in the blood. Will the effect be any different if the person is controlling sugar levels through allopathic medicines (maybe because of effects of medicine). Why are diabetics advised to eat regular meals? If a diabetic eats regular meals, he/she can prevent the extreme oscillations of blood sugar. In other words, each one is eating, he/she getting the energy the body needs to do its own activities normally. Next, regular meals will provide moderate high blood sugar levels, avoiding spikes or extremely low glucose levels. Moreover, this situation would stay for a longer period than if a person would be fasting for long times or eating too often. In this way, diabetics would not feel hypoglycemic (tremor, shaking, fainting-like), which is enhanced by the use of drugs or other natural changes they might be taking. In addition, if body cells, especially brain cells are supplied with nutrients and energy they need; one can concentrate or make clear decision without being over-or-down-loaded:). It would be much easier for a person to deal with stress than in other situation. Furthermore, the food choices one would make to cut the hunger of extreme fasting is very very unhealthy (i.e. pre-packed foods). The result would be fast spikes, the next hunger feeling would be in a short time; altogether they would affect the weight management. 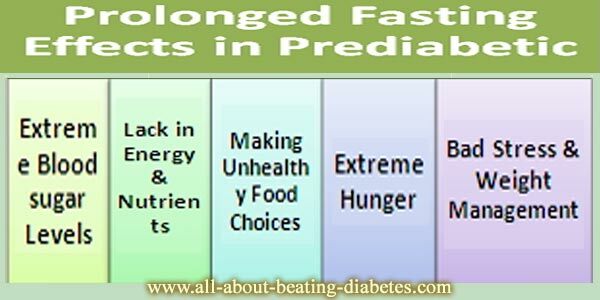 What is the effect of prolonged fasting on a pre-diabetic resorting to naturopathy? Fasting means: not eating or drinking anything! A prediabetic relying on naturopathy is not fasting. He/she is just avoiding or skipping the meals. As explained above, this is not a good decision if one wants to beat diabetes. Our body needs nutrients; therefore, it needs to eat. Eating in moderation, regularly and the right foods can make the difference. Staying for a long time fasting would worsen your situation because you are putting your body into a closed cycle of hunger. If this is the case, our body will consume all his reserves to supply its cells with energy if you are not eating. Even this process needs energy, so, as you can imagine, your body is suffering to provide itself the energy its cells need. If you were to eat regularly, that would not happen. So, your body needs "DOUBLE ENERGY". What happens if a person is fasting for a long time and is taking medicines? The worst picture is when one is taking lowering blood sugar drugs and not eating. Drugs have their side effects as they acts in a very very short time. So, their most common side effects is Hypoglycemia (which is severe in many cases) and which might lead to diabetic coma in a short time. Fasting (not eating anything for long time) damages the balances of our body, putting him to work in a stressful situation which requires extra energy. The nutrients our body needs come mostly from food we eat and drink and what our body produces on its own. Although the ability to produce the nutrients when not supplied from food, at the end, our body will "Give up" and problems from severe malnutrition will rise. So, think it over: Diabetics are not invalids and are not forbidden to eat. The most important thing is to use the Moderation Rule.